Thanks again to all of you who have supported me in my blogging past. I wanted to take a moment and update you on some changes to look forward to in coming days, weeks, and months. 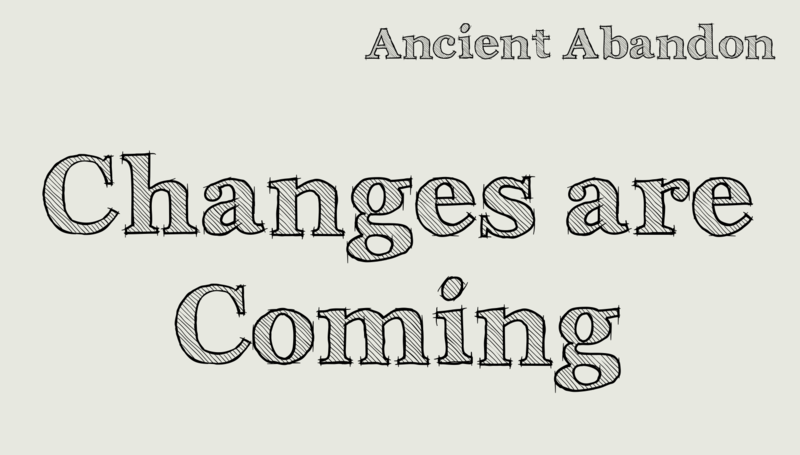 In the near future AncientAbandon.wordpress.com will become AncientAbandon.com! Up to now this blog has been more or less an outlet for studying the Bible along with sharing lessons I’ve written up for classes and such, as well as the occasion musical post. Over the last few months my family and I have been undergoing a lot of transition. During this time I’ve had a chance to reflect on my life and experiences. I’d like to see this blog become more than just writing about whatever finds it’s way into my mind, which is why I’m redirecting this blog moving forward. Ancient Abandon will be focused on living as a devoted Christian in a post-modern/post-Christian world. Please share the news with friends and family that you think would like to follow Ancient Abandon as we walk down that path together! With these coming changes expect more intentional and focused content as well as new opportunities to get involved with the Ancient Abandon community including Q&A, Giveaways, guest writers, and more! I’m really excited about these changes and welcome your feedback. Comment below or contact me directly with and thoughts or questions and be blessed! Did Paul actually believe that Jesus is God? I’ve chosen AncientAbandon as my first dedicated blogging site! Read more and share with your friends!